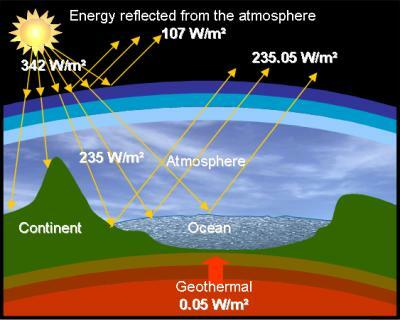 Our planet receives 342 [W/m²] of solar energy (*), 235 of which contribute to its thermal equilibrium. (*) Averaged over the year and scaled to the total surface of the earth (continents and oceans) at the surface level. 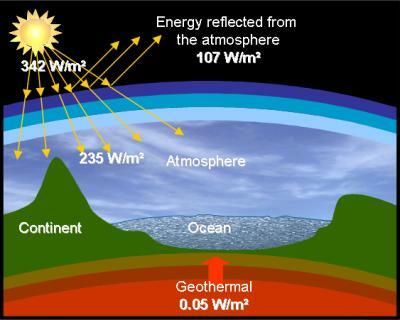 As long as the planet emits as much heat as it receives from outside (from the sun), or from inside (from the center of the earth or from human activity), its temperature remains constant. Since the 80s, this equilibrium seems broken by the addition of an extremely small power of human origin which amounts to 1.5 x E13 [W] and which represents only 1/10,000th of global energetic fluxes. This situation is all the more surprising since at the beginning of the previous century a “solar forcing” (attributed to a variation in solar activity) tens of times greater than this current human power only generated an increase of a few 1/10th[°C] (1/10th K). 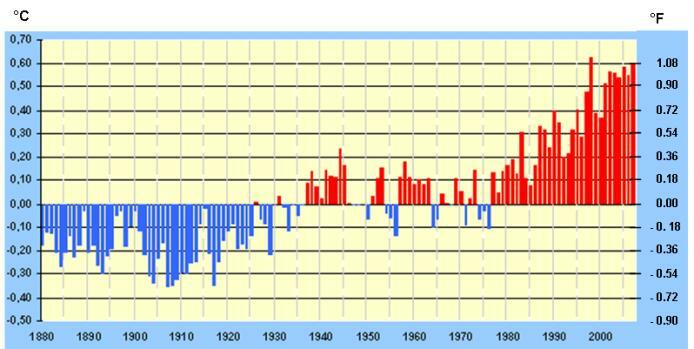 Between 1905 and 1945, the warming of the planet was approximately 0.4 [°C] (0.4 K). Between 1975 and 2005, it was at least 0.5 [°C] (0.5 K).